Arnica Montana or just arnica as it is most often referred to has a centuries old tradition as an effective herbal topical pain reliever. From ancient people to modern athletes, The benefits of arnica have withstood the test of time as the herbal remedy of choice. It becomes more clear with time that everything we need to be healthy has been provided by nature. We just have to recognize these healing plants and herbs and make proper use of them. Fortunately herbalism has a well established tradition for doing this. Arnica Montana is a yellow flowering plant that grows in mountainous regions and is native to North America and Europe. It has a pine scent when the leaves of the plant are rubbed or crushed. This is due to a phenol compound called “thymol” which has both antiseptic and anti-inflammatory properties. The benefits of arnica are most often utilized in arnica gel, arnica oil, or arnica cream, applied to the skin as a topical pain reliever. Although few properly done studies attest to the effectiveness of Arnica it has shown value in accelerating wound healing due to it's active compounds, arnicine and trimethylamine. The thymols in arnica which have vasodilating properties are thought to be responsible for it's ability to reduce pain and accelerate healing after certain types of surgery. It works through it's ability to stimulate the activity of white blood cells and combat bacterial infection. It also clears fluid from joints and muscles which have undergone trauma and swelling. This ability to disperse fluid from swollen and inflamed tissues greatly adds to it's effectiveness as the topical pain reliever of choice for people in all walks of life. 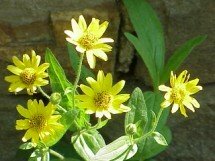 Arnica is toxic for internal use unless it's in a homeopathic preparation which is an amazingly dilute substance, in some cases having none of the original substance left in the tablet. Arnica should never be used by women during pregnancy as it can have a stimulatory effect on uterine contractions. Although it is non-toxic when applied topically, pregnant women should obviously be cautious about using it or any internal or external medication which could enter the blood stream and affect the fetus. Always check with your doctor first to be on the safe side! preparation. Herbal arnica contains the active compounds of the plant in a much higher concentration than the homeopathic product, thus the potential for toxicity exists with the herbal form, but not with the homeopathic products. It is most often included as an ingredient in over the counter topical products designed to work on bruises, swelling, and inflammation. It is used a lot by athletes and people who are engaged in strenuous physical activity that sometimes results in soreness or injury. 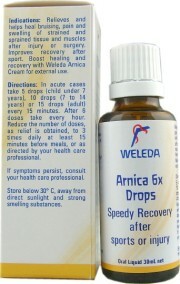 Homeopathic arnica is available in creams, gels, oils, or to be taken internally in the form of tiny pellets. Toxicity is not an issue due to the extremely low amount of arnica actually present in these types of products. Interestingly, the FDA has regulated homeopathic products as drugs since 1938 and has established standards for their safety and use. 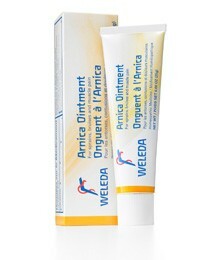 I have used arnica gel on numerous occasions and can attest to it's anti-inflammatory properties. It is pleasant to use, and does work for bruising and swelling injuries. It can also be used for sore or overworked muscles. My choice for topical Anrica products is Weleda, as they have been around for many years and their products are carefully formulated to adhere to the principles of Anthroposophic Medicine. Whether you are an elite athlete, weekend warrior, or occasionally need relief from strains, sprains, or bruises, keep Arnica Montana in your medicine cabinet. You can't go wrong with the benefits of arnica.